iMac orders in Europe are now estimated to ship in as little as 5 to 7 business days, a major improvement over previous estimates, but a number that still lags behind Apple's turnaround in the U.S.
Apple's online stores across Europe began updating on Monday to reflect new, faster estimated shipping times for iMac orders. In countries such as the Czech Republic, both the 21.5- and 27-inch varieties ship in 5 to 7 business days. 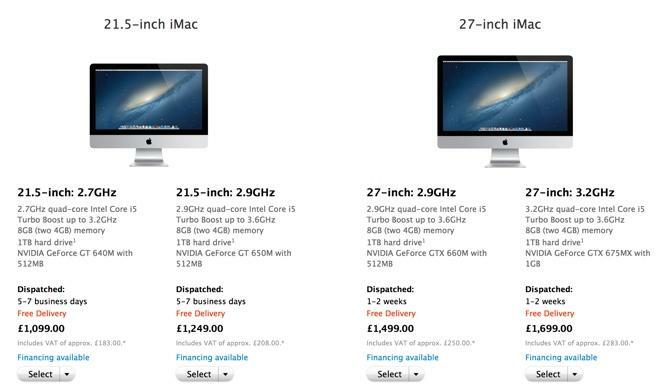 However, in the U.K., the larger 27-inch iMac variety is advertised to ship in 1 to 2 weeks  an improvement from previous estimates that took up to a month, but still slower than the 21.5-inch model. All of the times in Europe are still short of the U.S., where Apple's online store estimates that both screen sizes will ship within 1 to 3 business days. Just last week, the 21.5-inch model was estimated to ship in 2 to 3 weeks, while the 27-inch model took up to a month to ship. Improved shipping times around the world are a sign that Apple has been able to address the apparent production issues that limited supply of its redesigned iMacs. The all-in-one desktops reportedly use a unique screen lamination process that hampered production. Overall Mac sales took a hit last quarter, which Apple attributed to severe constraints of the new iMac after it launched in December. Market watchers expect that Mac sales will rebound this quarter with improved iMac availability.